Villetta dipped in the peace of the wood where you can detoxify from the noises of the city and regenerate you with those of the nature. You can hike, ride the lake Ampollino, skating rink, pick mushrooms in the season, pick wild strawberries and wild raspberries in the garden, ski in the winter with equipped slopes nearby (Villaggio Palumbo) and even just live in nature. In the area there are market, dairy, bakery, butcher, various restaurants, b & b. The area is inhabited all year round. The house is composed of entrance on living room / dining room with fireplace, kitchen and bathroom all on the ground floor and on the first floor 2 bedrooms. The windows are wood typical of the place, the heating is with electric panels. On the back there is a large woodshed and an LPG tank. As you can see from the photo in front of the entrance of the house there is a large space to live during the day in the summer and the parking area inside the fence of the villa. The house is completely in reinforced concrete. 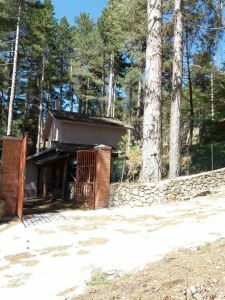 From the provincial road, the house is accessed from a newly built road.